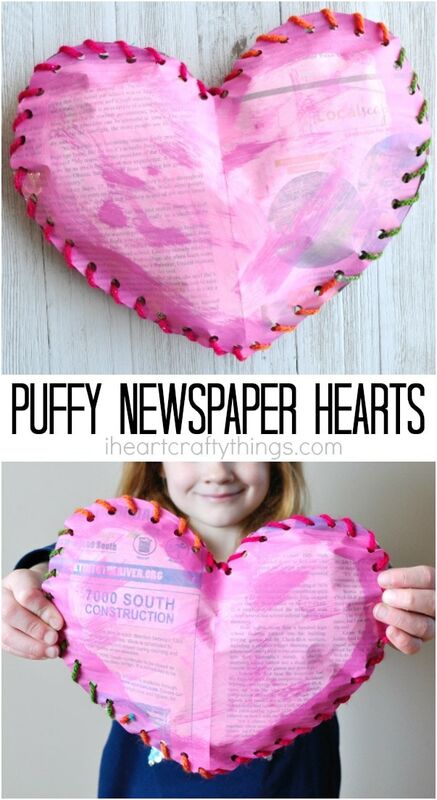 Our obsession with using newspaper for crafting continues today with us sharing how to make this painted newspaper puffy heart craft. 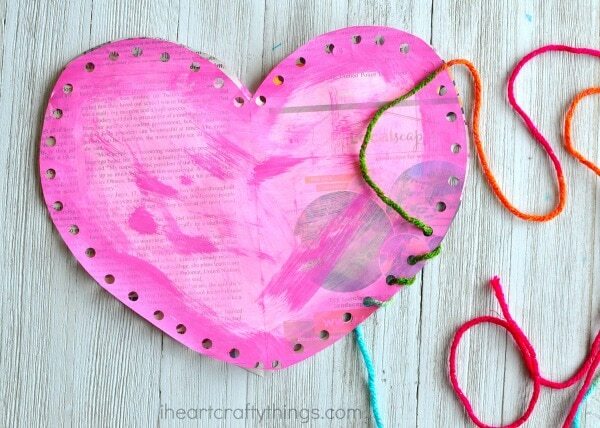 There’s so much to love about this simple Valentine’s Day craft! 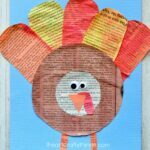 It is made out of newspaper, which is awesome if you love crafting with recyclable materials, and the threading is fabulous for working fine motor muscles. 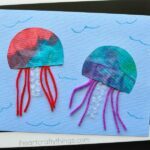 Go grab your supplies and get ready for some Valentine’s Day fun! Look for some book recommendations at the bottom of this post. 1. 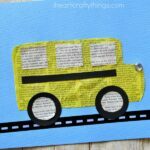 Start by painting a large section of newspaper with the colors of your choice. Let the paint dry completely. 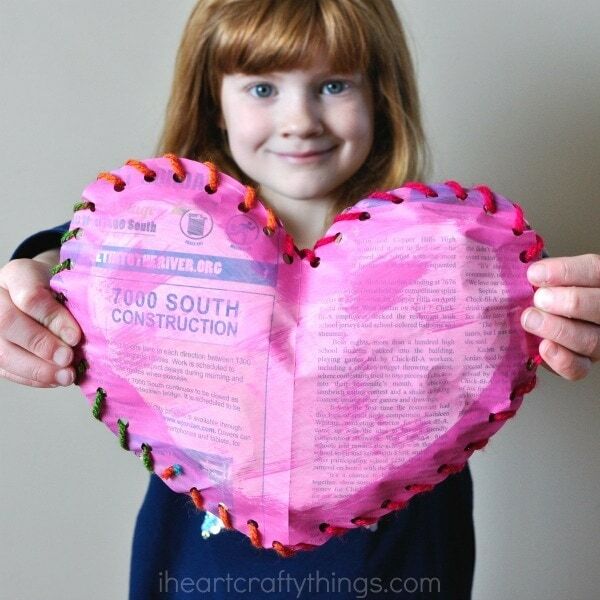 Fold your newspaper in half and cut out a large heart shape. I folded the newspaper in half to make sure to get two hearts of equal size. 2. Place your hearts together with both of the painted sides facing out. 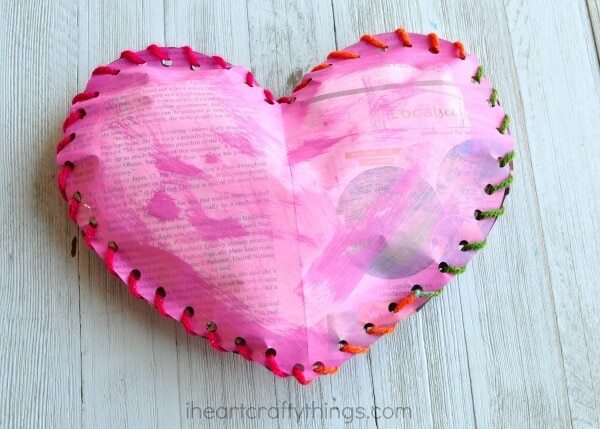 Now take your hole punch and while holding the hearts together, punch holes all around your hearts. 3. Cut off a large piece of yarn. Thread one end of the yarn through the hearts about three-quarters of the way down on one side and then continue threading through both of the hearts, connecting them together. 4. When you get to the other side of the heart about three-quarters of the way down, stop threading and stuff your heart with crumpled up newspaper strips. Be gentle so as not to rip the yarn through the newspaper holes. After filling up your heart so it’s nice and puffy, continue threading the yarn through the rest of the holes. When you reach the other end of your yarn tie a knot to hold the thread and heart closed and then cut off any remaining yarn.